Boring lunches? This is the fix! 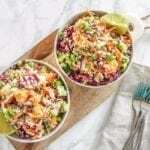 This Coconut Lime Quinoa Salad is a great make-ahead big-batch recipe that will take your tastebuds to the beach on gloomy days. Boil the quinoa in water according to package directions. This should take about 12-15 minutes, and all water should be absorbed. Remove it from the heat, fluff with a fork and allow it to cool. Whisk together the dressing in a small bowl and set aside. Prepare all remaining ingredients as indicated above and toss them together in a very large bowl. When the quinoa has cooled, add it to the mixture, along with the dressing. Stir well to coat. While this salad can be enjoyed right away if you like, for best results, let it sit for at least 30 minutes – or overnight if you can. The quantity of dressing used is fairly small relative to the size of the salad because the lime, fresh herbs and peaches do an amazing job at creating flavour and moisture.